And Jodi, I’ll show you what I’m knitting when you show me a picture of your puppy. 150 yards so far…I still have to spin a few more ounces of merino before I can ply the rest. I was so geekily thrilled, I wanted to do a little dance when it came off the noddy all BALANCED and everything. It hung there like a real, respectable skein. Squee!! 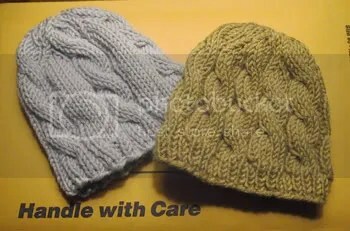 Mad props to the SweaterBabe, whose own cabled beanie pattern inspired these variations. CO 80 sts, pm, and join to work in the round. Work 6 rounds of 2X2 ribbing. Now, the decrease rows start…. 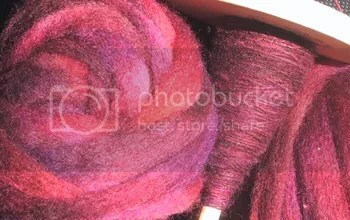 Pull yarn through remaining sts with a tapestry needle. Pull through to inside, and weave in all ends. off…4 oz. of Jacob/Corriedale/Mohair, about 320 yards. 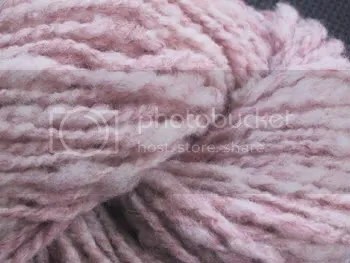 I’m going to ply this with a coordinating solid color, probably deep purple, if the roving I just ordered from the Yarn Tree matches. 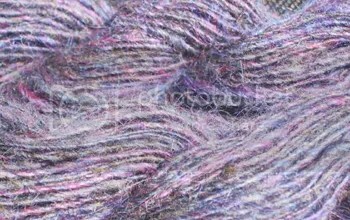 The yarn is darker in person — looks light grey in the photo but is actually a darkish grey with deep blues and fuschia/purples. on…handpainted Ile de France X Dorset from High Prairie. Mmmmmmm. 1. Pumpkin hat. The requisite on-the-go project, but I haven’t really been going anywhere. Enough to do right here at home. Pumpkin hats are kind of boring. 2. Soaker pants that have been a half inch from completion for at least six weeks. That last half inch is stranded colorwork. I’m really trying to like it. But I hate it. 3. Swingy tank top for DD. About an hour or two from completion. Meh. 4. Right front of the fab lace-inset cardigan. Requires a bit of concentration, what with all the reverse-shaping, row-counting, don’t-forget-the-buttonholes hoo hah. Yeah, my right arm is twinging and tingling in places I never knew it could. But I’m done! 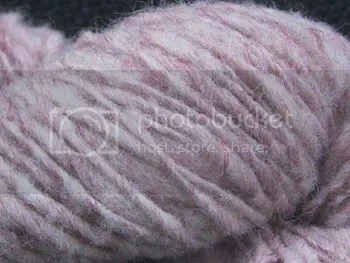 Funny, the tag said 4oz, but my finished skein weighs 3.25oz. 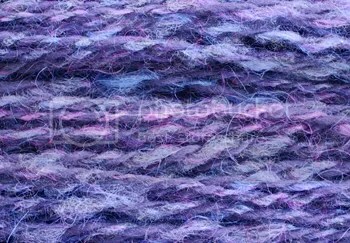 Anyhoo, it’s 150 yards after plying, and it’s very soft! 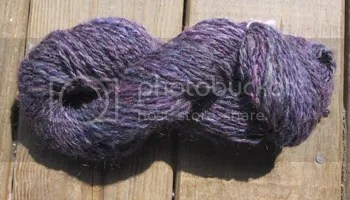 A step in the right direction — each new wool I spin feels a bit less like rope, and a bit more like yarn. I seem to be sighing a lot lately…this time ’cause I’m bummed. Bummed that I always seem to fall in love with things that make my arms hurt. It’s like each hobby I adore gives me a different repetetive stress injury. My arm kills from spinning….but I want to keep doing it! I’m on a roll…. I’m dying to spin the last ounce so I can ply it, but my arm is begging me not to. …that my first waking thought today was of spinning. I even briefly considered bringing my spinnig to the mall (instead of my knitting) but decided that it would be a bit much. Needless to say, I’m really, really enjoying working with this fiber, even though I’m still having to park and draft. And I’m pleased to report that when I’m done with this roving, I’ll actually be able to make something. So far I’ve been consistent — about thirty yards to the ounce. 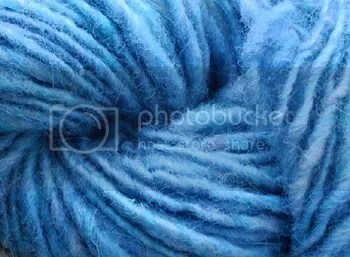 I wish the photo showed all of the colors — it’s actually more of a teal-ish hue, with blues and purples too. Lovely stuff.